A black and white negative of two unidentified women sitting by a rocky shoreline of a lake. Trees are visible in the background. In this view both women are looking at the photographer. Written on the negative envelope is Mrs. Ruddy. 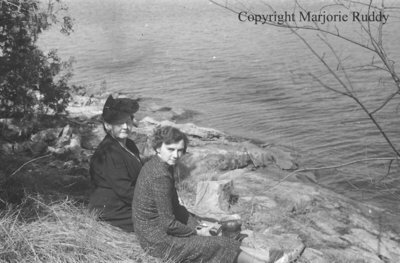 Unidentified Women Sitting By A Lake, April 27, 1941 , Marjorie Ruddy. Whitby Archives A2013_040_961B.